Products of the major histocompatibility complex (MHC) of genes play several key roles in the autoimmune response. Besides being predominantly responsible for the rejection of tissue grafts and graft-versus-host reactions, molecules encoded by MHC genes are directly involved in the recognition of antigen by T-cells. The MHC also determines to a great extent whether or not a particular antigen will evoke an immune response. The chapter begins with a synopsis of MHC antigens and their involvement in the normal immune response, together with a review of the factors involved in antigen presentation. This is followed by a summary of the recent studies which show that a wide variety of cells, including those from endocrine tissues, may express MHC class II antigens, like HLA-DR, under certain conditions. 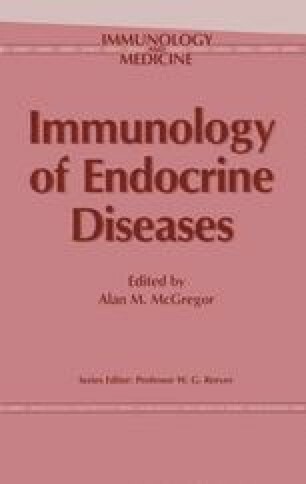 In the last section, the possible consequences of this phenomenon are discussed with regard to endocrine autoimmunity.